We recently did some re-modelling work in the house and made some changes to the kitchen. Instead of a built in fridge freezer there was now a freestanding American style fridge freezer. It's big. Huge, in fact. And black. Fairly obvious, you'd think. But in the first few days every time...EVERY TIME...I wanted something from the fridge I went to the cupboard where the old fridge used to be. Why? I mean...the new one was pretty hard to miss. How much more of a cue about where to get (a glass of wine) milk did I need? But I'd been going to the old location, and being rewarded by getting what I wanted from the fridge, many times a day for the past 10 years or so. The consequences of going to that location had always been good and so my behaviour remained strong even when there was a huge, hulking, black, shiny, highly obvious cue staring me right in the face! 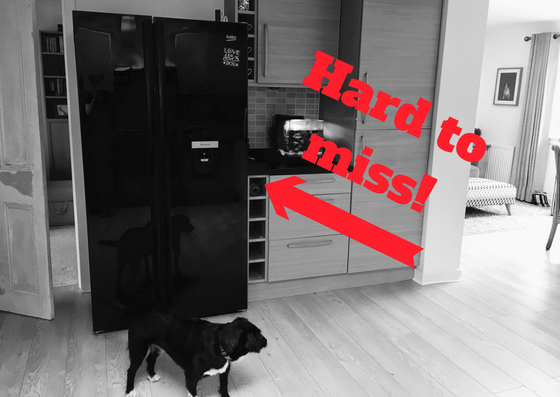 So...what does my inability to find the fridge have to do with dog training? It's a good example of previous consequences (successfully getting (wine) milk from the fridge) driving behaviour and not cues (the big shiny black fridge). Your dog doesn't sit just because you say "SIT"(your cue). He sits because of all the many times that you've rewarded him for sitting in the past. A strong history of good consequences makes that behaviour worthwhile for him and so he'll repeat it. Further, because it's what comes AFTER which counts then repeating your cues again & again or saying them louder & louder isn't going to make any difference to the behaviour either. Say it once, at most twice...if it's not happening after that then more training (& rewarding) is required. So pay often & pay well, whether the currency is food, games, praise or petting, because it's what comes AFTER that counts!